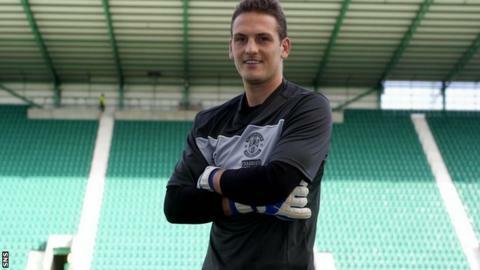 Hibernian have signed goalkeeper Sean Murdoch on a short-term deal as back-up for first-choice keeper Ben Williams. Murdoch, 26, came through the ranks at Dunfermline before spells at Forfar, Hamilton and Accrington Stanley. He will be at Easter Road until January, his arrival made necessary by Calum Antell's loan move to East Fife. Boss Pat Fenlon told the Hibs website: "He has been training with us for the past few weeks and has impressed us with his ability and his attitude." Speaking before Saturday's visit of Dundee, Fenlon added: "He will come in and automatically provide us with experienced cover for Ben Williams. "We felt that it would be beneficial for Calum to get a regular run of first-team games with East Fife. "His loan move will give him more experience and help his development."